Approximately 92 percent of adults experience anxiety when it comes to job interviews, so it’s completely normal to feel a little nervous beforehand. Whether this will be your first interview or you’ve had a bit more practice, it’s always a good idea familiarize yourself with different types of interviews so that you will feel prepared when the big day comes. To help prepare yourself, you can always ask your potential employer what kind of interview he or she will be hosting, either on the phone, one-on-one, panel, or group interview. The hiring manager will receive an overwhelming number of applicants for an open position, and will set aside the most qualified, organized and relevant resumes. Those who pass this scan are either asked to give supplemental documents, asked to schedule a phone interview, or asked to come to an in-person interview. If asked for a phone interview, make sure you take it as seriously as an in-person interview. Many applicants get cut at this stage due to lack of attention or unprofessionalism. These interviews will only last 15 to 20 minutes, but will give the hiring manager a good idea about whether or not they want you to come in for an in-person interview. The next phase tends to be the most stressful, but with practice you will be a pro in no time! 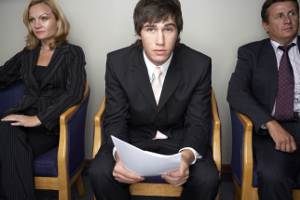 The in-person interview is typically the last stage before employers hire someone new into the company. Most interviews will last from a half hour to an hour (in some cases they can last even longer) and you can prepare by choosing your most respectable outfit, rehearsing possible questions and performing mock interviews. When it comes time for the interview, you will feel much more at ease if you’ve thought through the situation and feel mentally prepared. From the instant you arrive at the interview site, there will be eyes watching (from the receptionist to potential coworkers in the parking lot), so appear professional at all times. Often, employers will ask their employees for their thoughts on your professionalism and manners. Even opening the front door for a stranger could help impact your interview in a positive way. Typically potential employers will greet you warmly, shake your hand and guide you to where the interview itself will take place. A good handshake takes practice; it should be firm and confident with complete eye contact. This is typically the first impression you will leave, so ensure your handshake is as confident as you are (or, how you want to appear!). It is fine to place your portfolio in front of you, with a pen to take notes (if necessary), and always ask the employer if he or she would like a fresh copy of your resume. Since it’s often impossible to know how many people will be interviewing you, it’s best to have at least 4 copies on hand so you can supply as many as needed and still have one copy for yourself. Having a personal copy of your resume is a great way to stay on topic while having a guided list of your experiences to refer to, when necessary. These are the most common interviews and will most likely be conducted by a direct supervisor or someone from Human Resources. For these interviews it is important that you research the company thoroughly and know how you fit into its vision. Practice all types of sample interview questions	such as situational, behavioral, skill-set, and resume-related questions. Others interviews will be panel format. They are conducted by two or more interviewers in order to reduce the bias that often comes with individual interviewers. Make eye contact with the person asking the question, but make sure you are also giving each member on the panel your attention. Treat them all with equal respect and importance. Some interviews may be in a group setting, in which several candidates are interviewed simultaneously. This style gives employers an opportunity to notice leadership potential and teamwork. Group interviews can be the hardest because you are sharing the attention of the interviewers and may feel like you are being compared to your competition with each question that is asked. Take a deep breath and offer your answers when asked and be respectful of everyone at the table, especially the other candidates. Offering to answer a question first is a great way to set you apart from the pack early on, but avoid power struggles, as they may tell the hiring manager that you would be difficult to work with. Asking for a business card from the interviewer is a great way to get the spelling of their full name and contact information that you will need to write a personalized thank you note. Sending a simple email or a traditional card after you leave the premises is a great way to remind an employer about your interview, and to also reinforce your interest in the position. Though each interview will be different, every interviewer will respect a candidate who comes in prepared. Research the company before you go and practice, practice, practice to ensure you are adequately equipped. Whenever you get nervous, think of it this way – by simply asking you to interview, the company already has faith that you are qualified to fill their position.